Hey, this is Mark and I have a question. How can you accomplish your most important goals for 2019 within the first 90 days? One way is to surround yourself with a group of experienced leaders and tap into their collective experience. Imagine a group of pastors sitting with you, working with you, encouraging you, and even holding you accountable. That would be amazing! This kind of group is called a mastermind. In 2019, I will be offering three masterminds. These masterminds will be online. And they will be free for all! Here are the choices. Lunchtime Pastors' Mastermind - This is a 90-Day Mastermind for pastors that meets during lunchtime, 1:00-2:00 PM EST. It will start on January 10th. There will be two sessions per month - on the 2nd and 4th Thursdays of the month. There will be a total of six sessions. Each session will last 60 minutes. The final session will be March 28th. I will limit this mastermind to six participants. 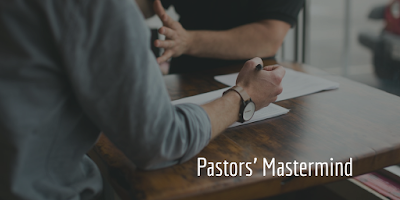 Evening Pastors'Mastermind - This is a 90-Day Mastermind for pastors. We will meet in the evening, 7:00-8:00 PM EST. It will start on January 3rd. There will be two sessions per month - on the 1st and 3rd Thursdays of the month. There will be a total of six sessions. Each session will last 60 minutes. The final session will be March 21st. I will limit this mastermind to six participants. Missionary Mastermind - This is a six-month mastermind for missionaries. We will meet from 1:00-2:00 PM EST. Each session will last approximately 90 minutes. We will start on January 3rd. We will meet monthly on the first Thursday of the month. There will be six sessions. The final session will be on June 7th. I will limit this mastermind to six participants. Again, these masterminds will be online. All you need is a computer or a smartphone and the internet to participate. And remember, there is no cost for you. Email me at Mark@coachingchristianleaders.com to reserve your seat.